Nope, it was the Alberta opposition party with no reps in the legislature that took home the golden drill bit. Step up Wildrose Alliance Party chief Paul Hinman and accept your gong. The reason why Ed Stelmach and the Alberta Tories did what they vowed never to do - and ditch a major part of the sacred new royalty framework - was not totally due to Hinman's needling. There was a lot of behind-the-scenes oilpatch arm-twisting too. But when Stelmach's struggling Energy Minister Mel Knight announced he "remains confident that the NRF is the right plan over the long-term," then trimmed $1.8 billion from the take for conventional oil and gas wells, the political win went to the Wildrose Alliance. Five days later, Knight was forced to make another "clarification" and roll back the implementation date from Jan. 1 to Nov. 19. Stelmach claimed it was in response to the "global economic crisis and a slowdown in oil and gas drilling," even though the rig count at the time was up from November 2007. Stelmach's response would be almost credible if Hinman hadn't stepped up his campaign three weeks earlier, demanding the premier not only cancel the royalty hikes, but scrap the $2-billion carbon capture and storage scheme. Hinman calls it a "pipe dream." "Now is not the time for the government to throw another wrench into the economy," the Wildrose Alliance leader spat. And when the premier and his energy minister - who was always a reluctant passenger on the royalty express - blinked, Hinman issued another statement condemning the move as "too little too late." Hinman called the Tory backdown "reactionary" and "policy-making on the fly." He then demanded a "full retraction" of the framework and "full and open consultations" with the industry. It's a long way from the Milk River Ridge to the legislature. But the rancher from Welling was clearly savouring his victory last week. "What these guys cannot understand," Hinman snapped, "capital is the easiest thing to move around the world. "Had they left things alone we wouldn't be going into a recession right now," he continued. Then he gave the premier this advice: "Recognize you did wrong, apologize for it and promise not to raise taxes again." Just two more sleeps and the 96th Grey Cup will be decided. Of course so far as I am concerned there is only one possible outcome; the Stamps will take it. I will not go so far as to predict the exact score. My other prediction is that I might not be able to watch the game. I may be called upon to fulfill my “Assistant Coach” duties and aid in the expansion of our “family” team. Our first grandchild is not due for another two weeks, but there have been rumors and rumblings that he could arrive early. This of course would step up the “parent training” schedule. Late yesterday these rumblings were confirmed by the team physician; who advised we should prepare for the rookie arrival which could come within the next 72 hours. 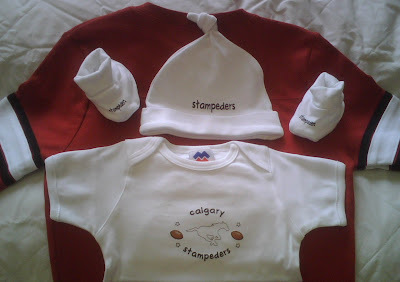 With this in mind I have secured an appropriate team ensemble for the new arrival. Deliver the cup to Calgary and I will try to help deliver the Grey Cup baby. I see my MLA, Kyle Fawcett has taken the "The Legislator's Pledge". I will use some combination of my constituents' views and their interests in deciding how to vote on their behalf. Some representatives believe that it's the role of the representative to judge for themselves what will best serve their constituents, while others believe that they should act as a mouthpiece for their constituents' views. Many have an approach that combines these two views. CURD believes that there is legitimacy to both views, and does not seek to impose one or the other on legislators; what we object to are representatives who substitute the dictates of their party's leader for any regard for their constituents. While I highly doubt Premier Stelmach or the PC party whip would let him freely vote on any issue; I am looking forward to seeing how Kyle Fawcett votes on "Bill 208: Alberta Affordable Mortgage Protection Act." Click here to see if your MLA has taken the pledge. What exactly are they doing at city hall? Are they using our money wisely? Are they, “walking the talk? Without an independent audit and review; we are really only left with the propaganda they dispense to us. This is usually in the form of a multi-page glossy booklet that we pay for and receive in a timely fashion, just prior to our going to the polls. This week though I received some insight, which is both independent and I will pass along to all taxpayers at zero cost. Now my blog is but a baby in the blogosphere, I don’t get a huge amount of hits. Typically my visitors are my family, friends and online acquaintances. Occasionally when I am critical of the PC’s I get hits from the Legislature or as was the case during the election hits from my fellow candidates. Generally these hits occur when I mention the names specific people or issues. Possibly they are googling by chance or more likely have a permanent search set up to find out what is being said about them. From my past (bad) internet experiences; I must agree it is a very good practice; especially for those “in” elected positions. Normally they only stay for a few minutes and move on, having realized I am just another online blogger. My hope is that come the next civic election at least a few Calgarians are doing some research and that they stumble upon this entry. If you read my entries on Oct. 30, you will know I made mention of a certain alderman. I posted it at approximately 12:30 PM. I somewhat expected to get a hit from the City of Calgary, especially if said alderman happened to have a google search set up. Here is a screen shot of what I actually got. Indeed it is a hit from the City of Calgary; but look at the visit length. This is truly a record for my blog. Over 23 hours!! There is not enough information on this blog to take anyone nearly 24 hours to read it, nor is there anything that would keep anyone’s attention for that long. They did not come and go; as that would show as multiple visits. Also they only visited one page; the path does not show any other pages being viewed during that visit. I find it very odd to keep a screen you have already read, open this long. Surely you would notice after a while and close it. Certainly you would notice it at days end or in the morning when you start your work day. Which really brings us to the critically question; why is a computer at the City of Calgary being left to run for 24 hrs? Aren’t they the ones telling us to turn off the lights, turn down the heat, use appliances during off peak hours, etc, etc. 10 Things You Should Never Do! Turning computers off at night when you leave produces an energy savings of 25%! Hard drives built in the early 1980's may have been sensitive to on/off switching, but today's models are not. In fact, it is best to turn off your computer if you will not be using it for more than half an hour. That’s right the #1 thing we should never do; that wastes energy…. I don’t know about you, but I think it is time for the extremists in City Hall to get off their high horses about how the rest of us are managing our households and clean up their own FIRST. To put it plain and simple start spending my tax dollars wisely before you come and ask me for more.